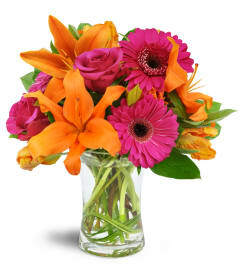 When cheeriness is the order of the day, send this gorgeous, uplifting floral gift to show you care! Whether it's a special birthday, a "get well" gift, or a "thank you" for a friend or co-worker, this bouquet will bring miles of smiles. Sunflowers, yellow roses, daisies, and kermit poms evoke the feeling of late summer or autumn. 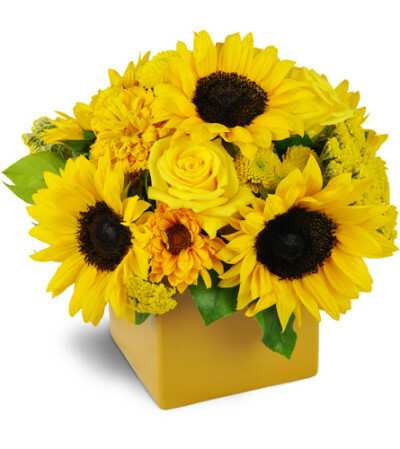 Sunflower blooms, yellow roses, and daisies are accented with kermit poms and burst beautifully from a bright yellow ceramic cube vase. Very happy with the service. Will order again! 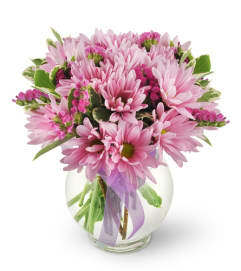 Online experience in purchasing the flowers was great. I ordered the deal of the day and hoped to get a nice arrangement delivered. It was a very nice spring arrangement and my mom loved it. Delivery was the to be the next day, which was great! The only thing that was not good was the late delivery. They were delivered at 8:30 pm— which is a little late for a senior. Mount Brydges Floral Design is a Lovingly Florist in Mount Brydges. Buying local matters. Discover how Lovingly supports local florists. Copyrighted images herein are used with permission by Mount Brydges Floral Design.